The Ontario Society for the Prevention of Cruelty to Animals (SPCA) is looking for staff. Not humans, but “hard-working, career-oriented cats” to kill verminUngeziefervermin on farms and in warehouseLager(halle)warehouses and breweryBrauereibreweries. “We’re looking for a cat who doesn’t like the in-house, on-the-lapSchoßlap lifestyle, who’s a little more adventurous,” says SPCA director Dave Wilson. “This would be the ideal situation for them to to apply for sth.sich für etw. bewerbenapply for this job,” Wilson told CBC News. The job ad is tongue-in-cheekironisch, nicht ganz ernst (gemeint)tongue-in-cheek, but the situation is real. Wilson and his colleagues are aiming to match straystreunend; Streuner(in)stray, unsocialized cats with farms and businesses that need help controlling mice and rats. The programme has been in operation since 2015 in the agricultural communities around Guelph, Ontario, where about 50 strays a year are finding homes — and employment. Farmer Irene LaPointe has adopted six cats to help reduce the number of rats attacking her chickens. “I have not seen a mouse or a rat for the longest time,” LaPointe says. As part of the programme, the cats are to vaccinate sb./sth.jmdn./etw. impfenvaccinated and implanted with microchips. They are also to spay (a female animal)(ein weibliches Tier) sterilisierenspayed or to neuter (an animal)(ein Tier) kastrieren, sterilisierenneutered, which helps reduce felineKatzenfeline overpopulation. 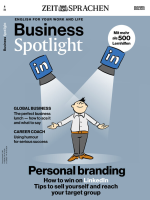 Dieser Beitrag stammt aus dem Magazin Business Spotlight none/2019. Die gesamte Ausgabe können Sie in unserem Shop kaufen. Natürlich gibt es das Magazin auch bequem und günstig im Abo.